Vancouver Fashion Week, Canada’s largest fashion event in Canada, and second largest in North America, has settled in nicely at the Chinese Cultural Centre, and the 15th year started out with a proclamation from Vancouver City Hall declaring this Vancouver Fashion Week. The Gala evening gave us tantalizing hints of what is in store for the rest of the jam packed week, and the week looks good including local crowd favorites Alex S Yu and Sunny’s Bridal. Visiting crowd pleasers returning include Gatsbylady London and Zuhal Kuvan-Mill’s Green Embassy, who wowed the runway with our own Nova Stevens epitomizing The Empty Ocean Series theme in a skirt made of recycled fishing nets and an alpaca bustier representing the coral. Special thanks to Nova who took time out of her busy schedule before heading off to Toronto to compete as a top 12 finalist in Canada’s Top Supermodel! Good luck Nova! Vancouver is rooting for you all the way! Of particular note, on my “who to watch”, was definitely the Japanese collection of Wasso Vege. His brilliant hued kimonos were both traditional and modern at the same time! His show closing collection on Tuesday will be a sure show stopper. I do not think that anyone expected Sasaki Vege (yes the name does stand for what you think… his father was one of the founding members of the Macrobiotic movement) to appear as the dignified businessman and athlete that he clearly is. I love how his description of the collection explains when you put on a piece of Japanese traditional clothing, the main constituent is not a person who wears it. A person is only tool for expressing clothes. The protagonist is absolutely the design and motif of the clothes, and the most important thing is the linear designs of clothes themselves. the person who wears Japanese traditional clothing, must adjust themselves to the line of clothing from the moment they put it on. The body of woman is tied or tightened with many kinds of bands and strings and fabrics. Sometimes you put padding between the clothing and the body as well. In other words, we sew the human body line into the kimono itself. This series of work is called “Kitsuke” Most of these concepts are very different from Western design and function. For this “LIPS on a SPIRAL” collection, WASSO VEGE’S utilizes the line and motif of traditional Japanese WASO, that can be worn in the same sense as western clothes for the western woman, while providing liberation from Kitsuke, a high degree of comfort, and ease of movement for Japanese woman. Atelier Valeria Costa was tonight’s only full show, and I do mean FULL SHOW! Valeria’s Costa had such a broad range of styles, fabrics and literally took you from beach to boardroom, to Belle of the Ball with a double dose of Brazilian Mardi Gras for good measure. Her leathers looked as soft as butter, and were worked into many beautiful daytime to daytime styles and textures. The bathing suits were bright and playful and the evening gowns were so varied, from embroidered, brocades, lurex, velvet, beaded, spangled and dangled! The two Mardi Gras costumes were any samba dancer’s dream. There literally was something for every woman in her collection and her post runway models were in high demand for photos. Congratulations to Valeria on her first show at VFW! To all the student designers and first timers, I want to share a second piece that was written by Kate Miles of Kate’s Couture. She was the youngest designer to ever show at VFW, never mind it was haute couture, and in the fall, she is starting at FIT in New York, and has already interned with Nicole Miller and will be having two internships in London this summer with a bridal designer and Jose’ Hendo! Please also check it out here on the Vancouver Fashion Week blog. There were also lots of upcoming designers in the audience and the house was full with standing room only. I am excited to see Sacha Cooper from Luxembourg present his Cooper Hotcooture collection! Jose Hendo is returning for her second time to Vancouver Fashion Week and her own outfit made you hungry for more. This eco fashion designer had a show stopping debut, with her felting techniques and her techniques for creating fabric out of tree bark. Don’t miss her show Saturday night. Vancouver Fashion Week is lucky to have recently returned Mrs BC and Mrs Canada Globe finalist, Tetyana Golota, walking the runway Saturday night for GatsbyLady. This was her inspiration to pursue modelling and participating in pageants as well as her own fashion design. She will also be walking for Jose’ Hendo on Saturday and for Green Embassy on Sunday! It is always so much fun to reconnect with so many friends between shows on the runway. 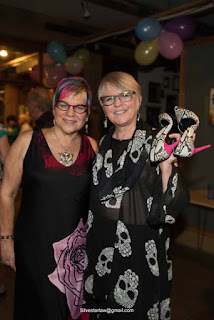 Special shoutout to all the people adorned in Carolyn Bruce Designs and I am always runway ready in K-O.Me and Spectacles that are spectacular by Sarah Moshurchak of Eyeland Framemakers. I also want to pay homage to my mother and sister in law who were devoted fashionistas in their own right, and whose cherished possessions are now in my safekeeping and worn with pride.